Preheat oven to 400 degrees. Remove chicken from refrigerator let sit out a few minutes to take chill off. Peel carrots and potatoes. Rinse and strip and dice celery. Chop into large pieces. 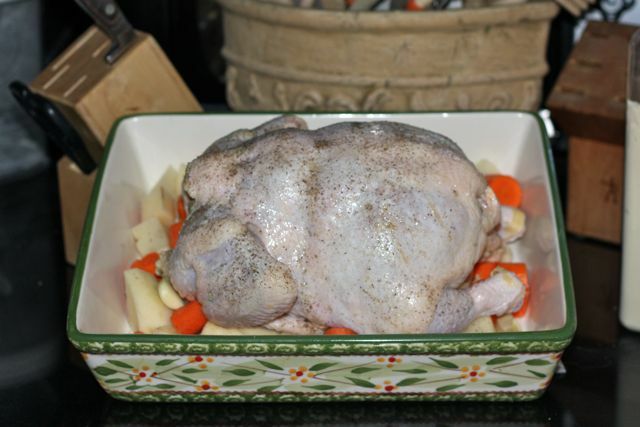 Place in medium size oven safe pan, slightly larger than the chicken. Lightly hit garlic to separate cloves and remove skin. Add potatoes, garlic and veggies to pan. Rinse chicken inside and out, pat dry and remove giblets. Rub chicken skin with oil, add salt and pepper. Place rosemary and lemon halves into chicken cavity. Place chicken on top of veggies in pan. Put in oven: 20-25 minutes per pound of chicken. i.e., 4 lb. 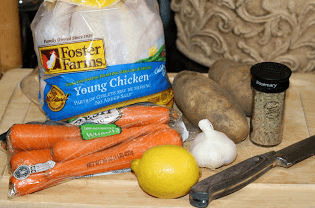 chicken takes 1 hour 20 – 40 minutes. Using a thermometer inserted into the chicken thigh, remove when it reaches 180 degrees. 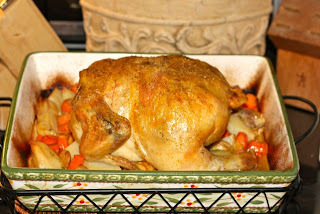 Remove from oven and cool 15 minutes before carving and serving.